Here's a good definition of irony. Last October, our IPMS club had their annual kit auction, where members bring in kits they want to sell, and the IPMS club receives a small part of the money made. 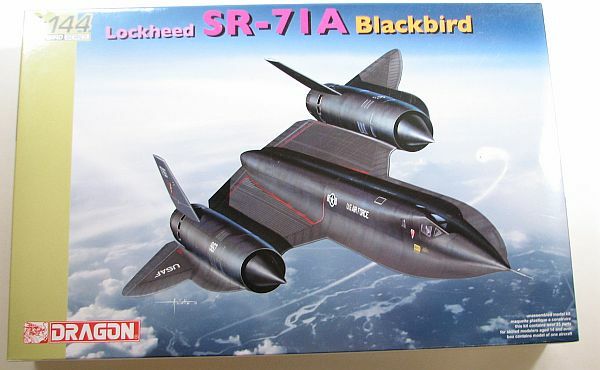 One of the items up for bid was an LS 1/144 SR-71. Not having one, I wanted it. So, we had a spirited bid between myself and one other modeler, but once it reached $20, I stopped bidding, thinking it was too expensive for me at that time. When I heard that Dragon was releasing their own new-tool SR-71, I knew I wanted one. So how much is it at the local hobby shop? Right around $26. 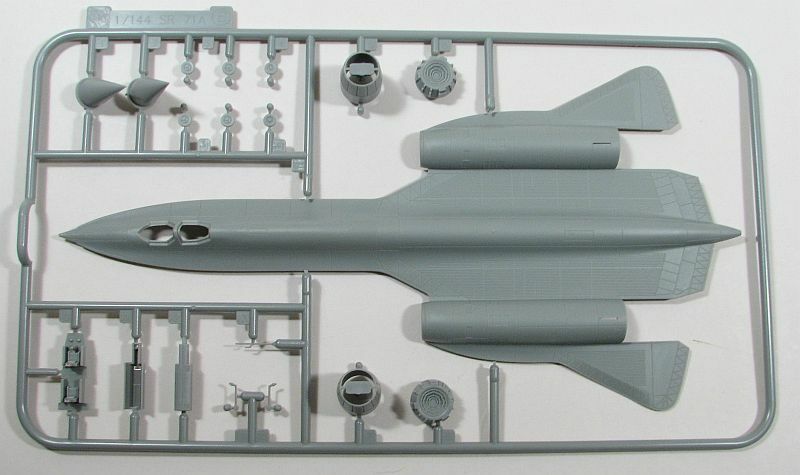 The Dragon 1/144 SR-71 consists of 33 gray, injected plastic pieces on two sprue, and a single clear sprue with two canopies on it. 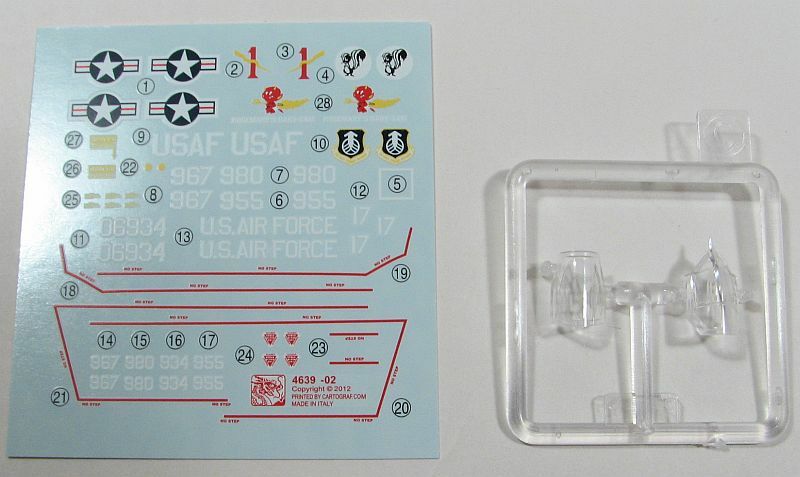 Decals – nicely printed and in register – are for four different SR-71s, the primary differences between the four being the markings on the vertical tail surfaces. Only three pieces are added to the lower fuselage half – a one-piece cockpit and two pieces (each side) for the main landing gear wells. The one-piece cockpit tub is nice enough, especially with the canopies closed and being such a small space. However, Dragon doesn't include any color information for the cockpit tub (which should be primarily finished in gray, with black side consoles and instrument panel). The only items I may add are seat belts made out of tape, as not much will be seen through the closed canopies. You'll need to do some research if you want to pose them open, because I'm unsure if the kit parts can be used that way. Once the three pieces are glued to the inside of the lower fuselage, the fuselage halves can be glued together. Now the rest of the airframe pieces can be added. Vertical tail surfaces, intake cones and exhausts will complete the model prior to painting (although the exhausts might be able to be left off until the end, helping with painting). Once painting is finished, then you can add the landing gear (and the model allows for both lowered and raised gear), although since most everything is "black", you could get away with gluing the landing gear on prior to painting. However, then you run the risk of knocking something off while handling. The Dragon 1/144 SR-71 is an excellent release. Since I passed on the LS one – as I wrote in my introduction – I can't really compare the two. However, the Dragon kit has a fuselage that is split only in half horizontally with all the other pieces being a single-piece. 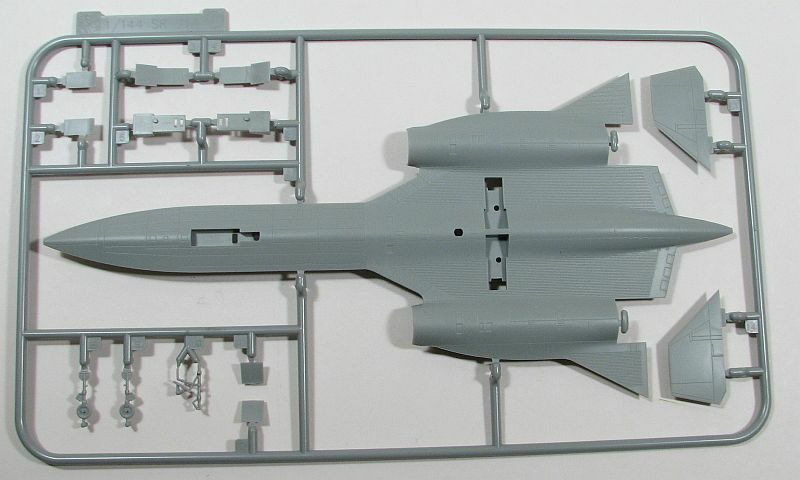 It should be a relatively quick build, so adding a 1/144 SR-71 to your finished shelves shouldn't take too long. I am definitely looking forward to building mine. Hopefully Dragon will see fit to come out with an A-12 and a YF-12, as well. My thanks to Dragon for the review kit.